This is a page from a 15th c. type book that I made entirely by hand for a client who wishes to remain annonymous. It is a book of love peoty and biblical illuminations on goat parchment, with genuine gold leaf, written and illustrated with precious and expensive pigments, many of which I made by hand from plants, animals and minerals. 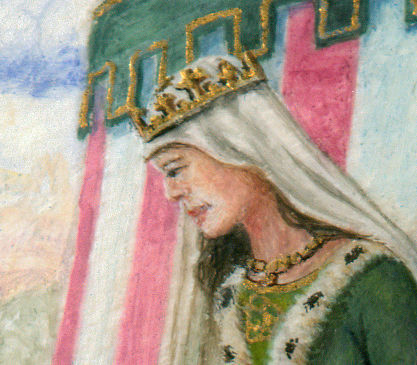 An extremely enlarged portion showing the opaque flat gilding and the iris green on her dress and the tent trim. 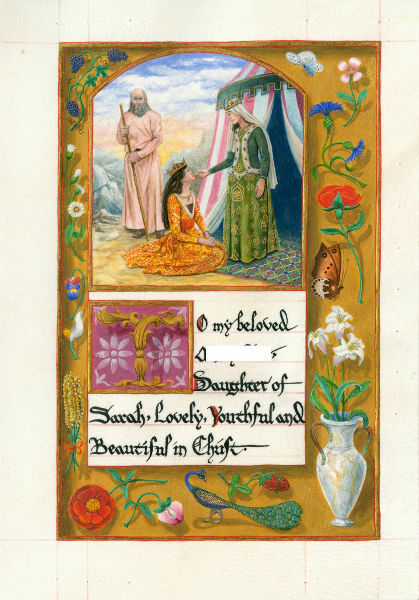 This is a border from another page in the book. You can see the pink ruling lines on the left.